This colorful picture is a mosaic of the Lagoon nebula taken by NASA's Wide-field Infrared Survey Explorer, or WISE. 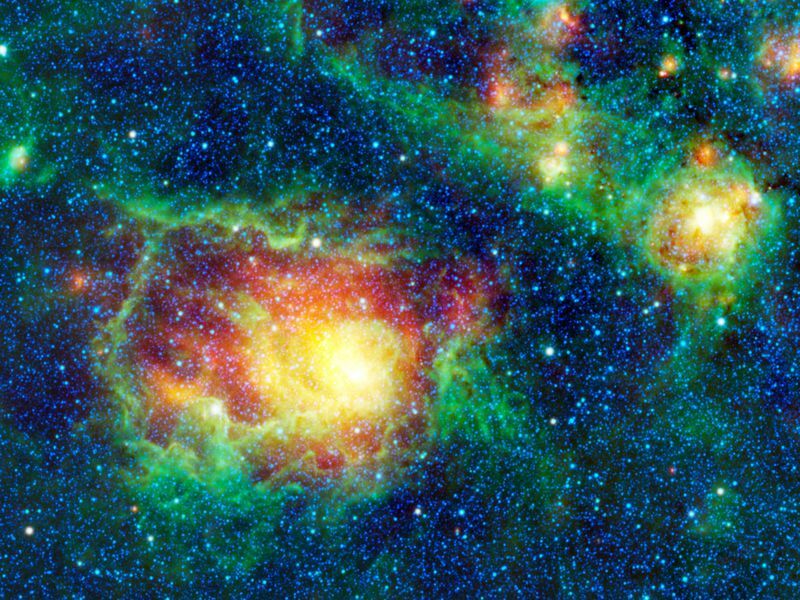 Normally, you would expect a lagoon to be filled with water, but this nebula is composed of clouds of gas and dust in which new stars are forming. Also known as Messier 8, or simply M8, the Lagoon nebula is seen here as a large circular cloud in the center of the image, surrounded by innumerable stars. This view is looking toward the center of the Milky Way, which is our home galaxy. Our solar system is located on one of the spiral arms, about halfway out from the center of the disk-shaped Milky Way galaxy. When we view the Milky Way from Earth, we are looking into the disk of the galaxy where stars are so numerous that they appear to us as a cloudy band of light stretching across the sky. The center of the Milky Way is located in the constellation Sagittarius, which is where the Lagoon nebula can be found. M8 is a favorite target for amateur astronomers because it can be easily seen with binoculars or a small telescope. Astronomers have identified several different parts of the Lagoon nebula, including M8E, a young stellar object, and the star clusters NGC 6523 and NGC 6530 (sometimes the designation of NGC 6523 is used interchangeably with M8). At the center of the Lagoon nebula is the star Herschel 36. Distance measurements to this nebula vary widely, from 4,000 to 6,500 light-years away from Earth. Also included in this image but not classified as part of M8, is another cloud of warm dust and gas, located up and to the right of M8. This cloud is emitting infrared radiation. 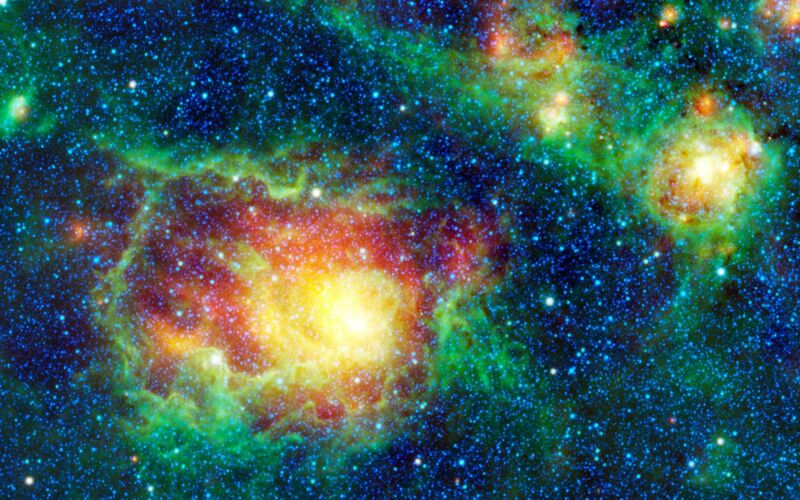 All four of WISE's infrared detectors were used to take this image. The colors used represent specific wavelengths of infrared radiation. Blue and blue-green (cyan) represent 3.4- and 4.6-micron light, respectively. 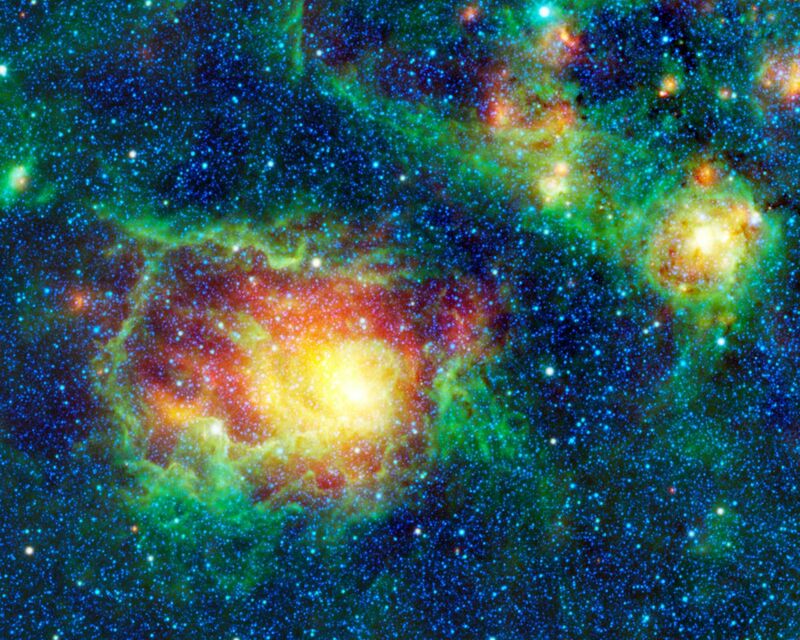 These wavelengths are mainly emitted by hot stars within the Milky Way. 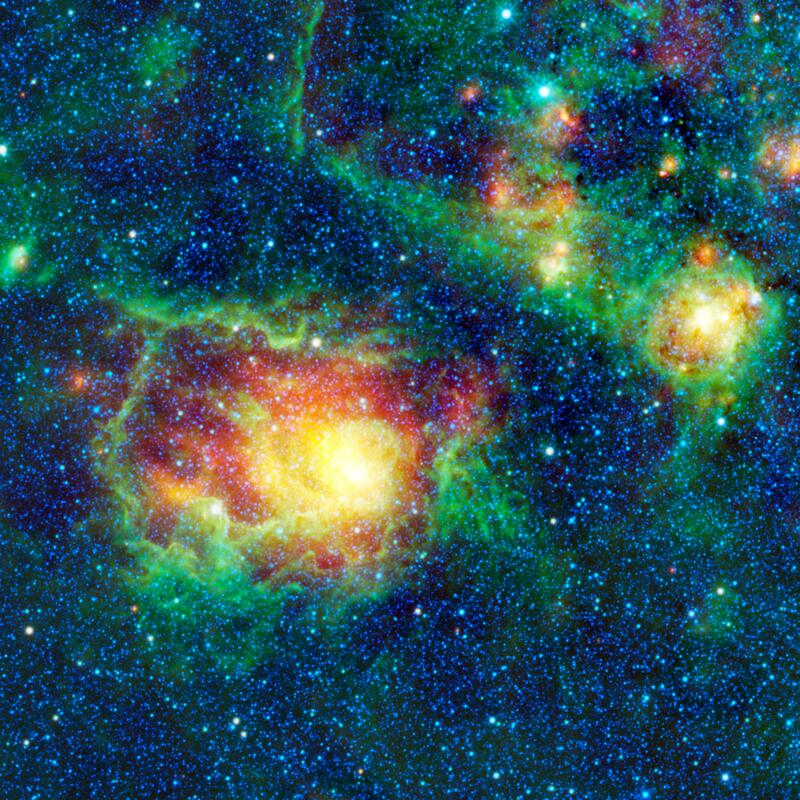 Green represents 12-micron light, which is emitted by the warm gas of the nebulae. Red represents the longest-wavelenth, 22-micron light emitted by cooler dust within the nebulae.